I am definitely not skilled in Persian cuisine, but I’ve eaten it and love all of the rich, warm flavors. 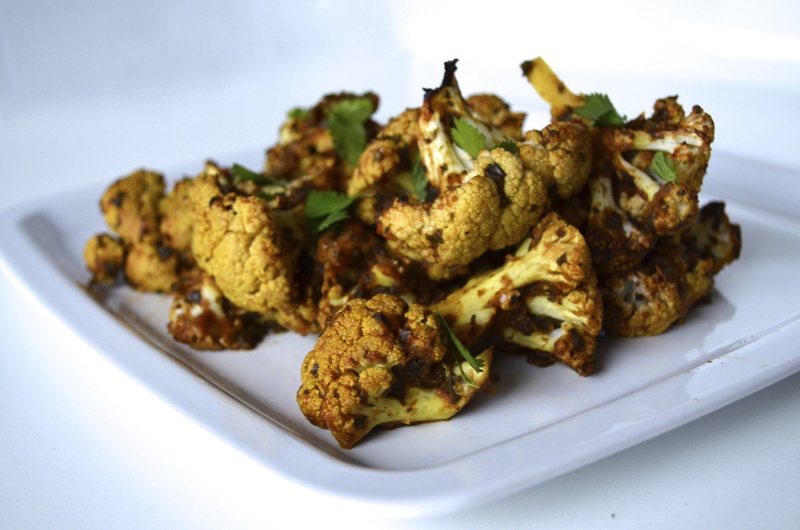 Here, tender roasted cauliflower takes on the flavors of cumin, cinnamon, mint, cilantro, and pomegranate… and will hopefully warm you up a bit on these super chilly nights. Preheat the oven to 450 degrees F. Lightly grease a baking sheet. Heat the oil in a large skillet over medium heat. Add the onion and cook for about 5 minutes, until softened. Stir in the kale and cook until tender, about 2 minutes. Add the garlic, cumin, turmeric, and cinnamon, cooking until fragrant, about 30 seconds. Add the tomatoes, scraping the bottom of the pan with a spatula to get any spices (flavor!) that might be sticking to the pan. Pour in the pomegranate juice, bring to medium-high heat, and let cook until the liquid has thickened, about 5 minutes. Stir in the cilantro and mint. Let cool slightly, then transfer the mixture to a food processor. Process until smooth. Season with salt and pepper to taste. Toss the cauliflower with the sauce, mixing well. Bake, stirring occasionally, for about 25 minutes, until tender. Switch the oven to the broiler setting. Move the baking sheet to the second rack from the top. Broil for about 5 minutes, until the cauliflower is dry and starting to brown. Garnish with additional cilantro and mint. Serve warm. It looke like a chip and dip I can’t find it anywhere. .